Fever is usually one of the first signs of an illness, and also one of the most immediate ones, as it is a natural physiopathological response. Other signs of an illness may appear later, when the disease has already spread. Degree2act has a very clear purpose: to detect potentially ill animals as early as possible. Once detected, you will be able to provide individual care to these animals. In order to use it you will need the Flir One thermographic camera and a smartphone compatible with it. Thermographic technology is non-invasive and non-destructive, and in the case of Flir One and Flir One Pro devices, it is also affordable ($250-$500 approximately). 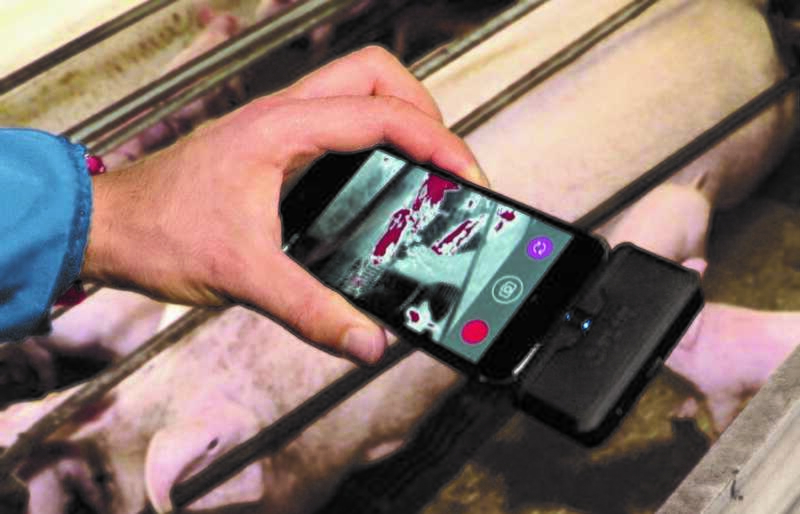 Usage of thermographic devices in the livestock industry has not been very widespread due to elevated costs and inconclusive studies, which mainly focused on measuring temperature. Degree2act does not measure exact temperature of an animal; it works within temperature ranges common for each production cycle and detects alterations. Degree project, the origin of the app, has been developed by a group of specialists from the fields of informatics, mathematics, statistics and veterinary science. The needs of vets and farmers have been approached from a new perspective, using affordable technology and establishing universal availability of Degree2act as priority. As a result two versions have been developed: premium (€2,99/month) and researcher (€4,99/month). Each of them adjusts more to either farmers’ or veterinarians’ needs respectively. Both versions allow the submission of records to our main database for analysis, a collaborative feature that with time will allow expansion to as many breeds and production types currently available. All users contribute to the fine-tuning of Degree2act, as this project’s development has been based on the idea of common interest and benefit. One of the driving forces behind Degree project has been the current issue of antibiotic resistance. Degree2act has been created as a tool for early detection precisely for the purpose of supplying therapeutic resources in a more efficient, conscious and necessary manner. Its interface is easy to use, it is very visual. Degree2act works as a traffic light: a green light is on when pigs are detected within camera reach, an orange light appears when temperature increase is detected but not significant. When a red light appears and a warning message pops up, it means that the animal on screen is very likely to have an elevated temperature. Degree2act has been available since 5 May 2018 and you can try it on a one month free trial. As reported by Beinfive S.L.